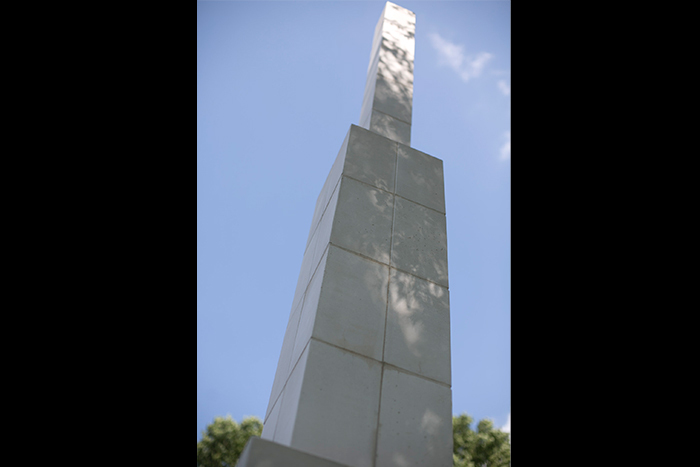 "Tower With Vertical Blocks 1" is situated outside of White Hall facing the Quad. "Untitled" is located in the courtyard of the Math & Computer Sciences Center. 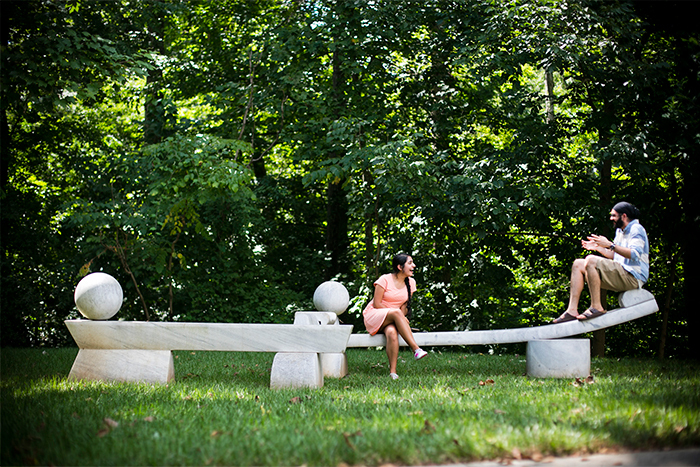 "Emory Bench Sculpture" is located on Fishburne Drive at the Baker Woodland across from the Rich building near the Michael C. Carlos Museum. "Source Route" is installed in the ravine across from the Carlos Museum as two pathways to the streambed of the Baker Woodland. "Untitled" is around the corner from the Trakas and Farlowe works on Fishburne Drive across from the playground at Glenn Memorial Church. 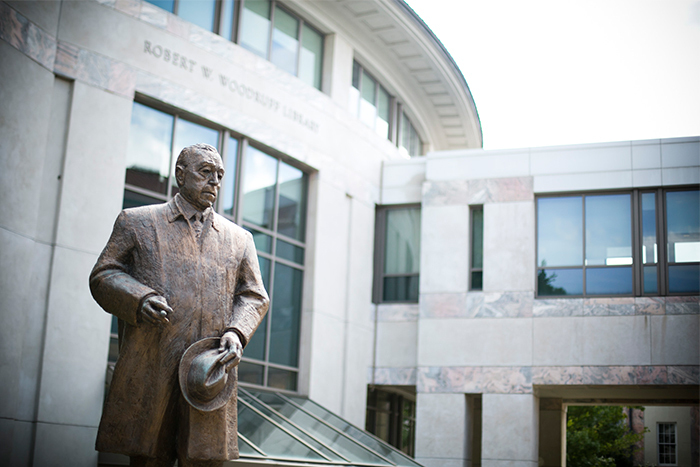 "Robert W. Woodruff" has a high-profile location in front of the library that bears his name. "Director's Chair" is installed in the nature walk area behind the Woodruff Library. "Construction #200" is the sculpture in front of the Schwartz Center for Performing Arts, donated to Emory by Donna and Marvin Schwartz for the venue that bears their names. "Whisper Chair" is set on Tull Plaza in front of the Anthropology building. "Dooley" stands in the center of a plaza near the Anthropology building, on the other side from the "Whisper Chair" and across from Cox Hall and the Dobbs University Center. "Stone Grove" resides in the green area between Cox Hall and Dobbs University Center. "An American Dream" is on the east side of the Woodruff Physical Education Center. "Untitled" is now in place at the courtyard of the new Health Sciences Research Building on Haygood Drive. A walk across Emory's campus reveals a variety of works of art by prominent sculptors, exemplifying beauty and provoking thought. Take a summer walk to experience the outdoor art featured on Emory's campus. Get out of the office or work area and view familiar landmarks from a different perspective or discover ones you haven't seen. The sculptures are examined and documented annually by student interns who work under the supervision of Michael C. Carlos Museum conservators. These students also help with routine maintenance activities and assist contract conservator Katherine Singley with washing and waxing of metal sculptures. The information provided here on the works of art is from Center for Creativity and Arts General Manager Randy Fullerton; Emory Architect Jen Fabrick; Public Art Committee Chair David Schuster; and Carlos Museum Conservator Renee Stein. "Tower With Vertical Blocks 1" is situated outside of White Hall facing the Quad. Minimalist artist Sol LeWitt designed the Tower, offering a choice of materials, and Emory had it constructed according to the artist's concept with funds from an anonymous donor. An Emory Magazine article by now-retired Emory art professor Katherine Mitchell discusses the work of LeWitt, whom Mitchell knew personally. "Untitled" is located in the courtyard of the Math & Computer Sciences Center. Creator Kyle Dillehay has said his artwork explores the interconnectedness of biological systems and how the human population has greatly altered natural processes. His sculptural and photographic work has a focus on issues related to the environment and the impact put upon the world by human societies and their urban settlements. 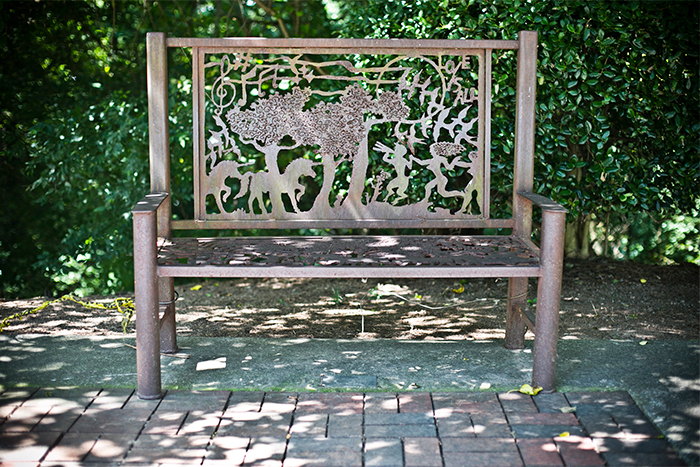 "Emory Bench Sculpture" is located on Fishburne Drive at the Baker Woodland across from the Rich building near the Carlos Museum. Artist Horace Farlowe used white Georgia marble to create it. Farlowe's career alternated between years spent as a painter and long periods as a stone sculptor. He exhibited his sculpture at many college campuses and galleries in Georgia and North Carolina. 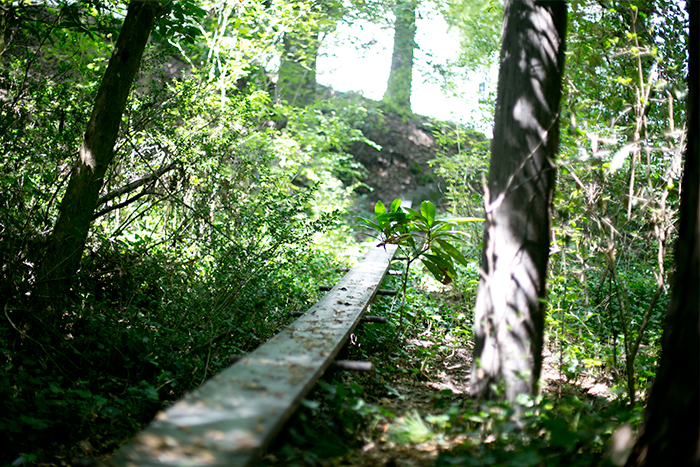 "Source Route" is installed in the ravine across from the Carlos Museum as two pathways to the streambed of the Baker Woodland. Sculptor George Trakas visited Emory in 2011 to conserve his piece of land art, installed in 1979, and to lecture. See his Creativity Conversation. He also received an honorary doctor of human letters at Emory's 166th Commencement in 2011. "Untitled" is around the corner from the Trakas and Farlowe works on Fishburne Drive across from the playground at Glenn Memorial Church. 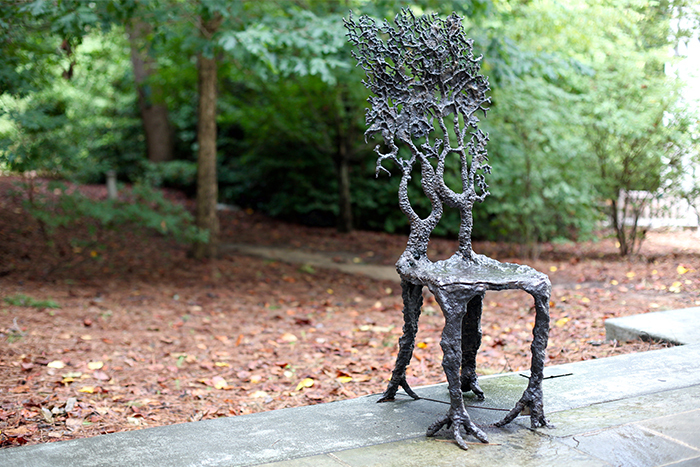 The sculpture was created by Athens, Georgia, folk artist Harold Rittenberry, who often described his works as "telling a story in steel." Rittenberry used Corten steel, which develops a thick rust that protects the metal interior. "Robert W. Woodruff" has a high-profile location in front of the library that bears his name. The bronze statue, installed there in 2000 following a stint outside the High Museum of Art in Midtown, is by William J. Thompson, a noted sculptor with a talent for large-scale portraiture. A plaque at the statue's base notes that it is on "generous loan from the Woodruff Arts Center." 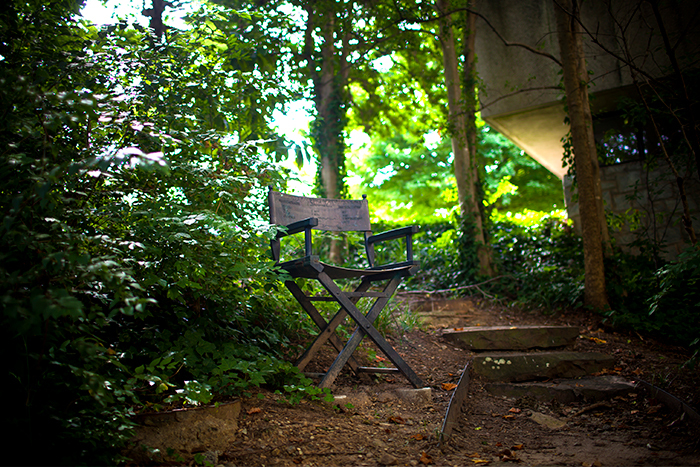 "Director's Chair" is installed in the nature walk area behind the Woodruff Library. The steel and bronze is piece by George Beasley, Regents Professor Emeritus of Art at Georgia State University and original organizer, 40-plus years ago, of the annual Iron Pour there. Another well-known work of Beasley's is the Five Points Monument, commemorating the historic intersection of Peachtree, Edgewood, Decatur, Whitehall and Marietta streets where it is installed. 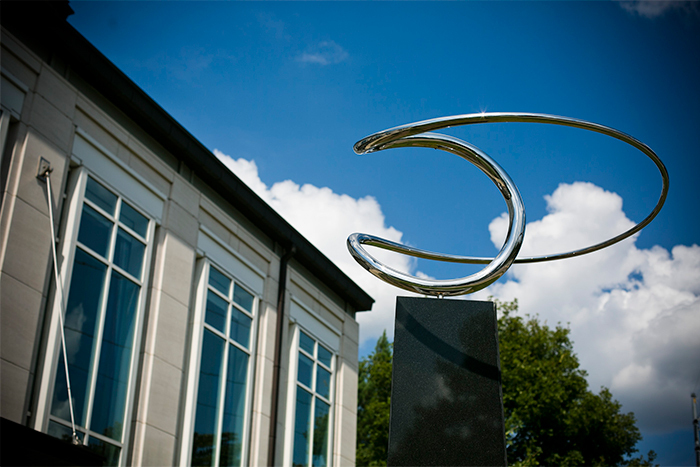 "Construction #200" is the sculpture in front of the Schwartz Center for Performing Arts, donated to Emory by Donna and Marvin Schwartz for the venue that bears their names. The stainless piece is by abstract expressionist sculptor Jose de Rivera, known for twisting steel or bronze bands into space-defining three-dimensional shapes, a process he called "plastic geometry. "Whisper Chair" is set on Tull Plaza in front of the Anthropology building. 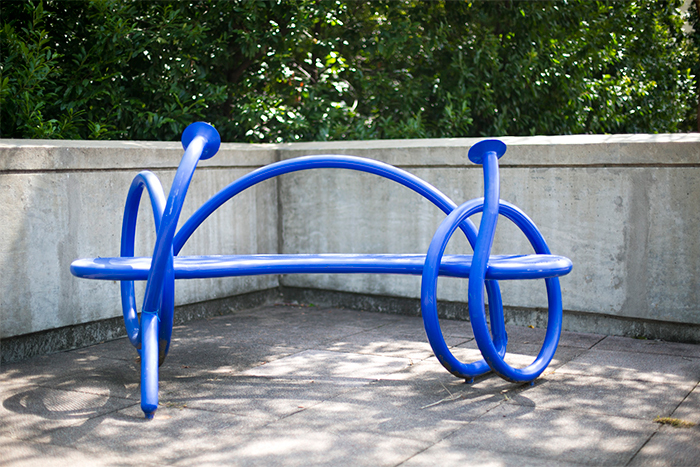 North Carolina sculptor Jim Galluci created the bright blue powder-coated steel bench intertwined with a hollow tube. Two people sitting on it can whisper to each other via the tube's two ends, which are at about face level for those seated, keeping their conversation private from passers-by. "Dooley" stands in the center of a plaza near the Anthropology building, on the other side from the "Whisper Chair" and across from Cox Hall and the Dobbs University Center. 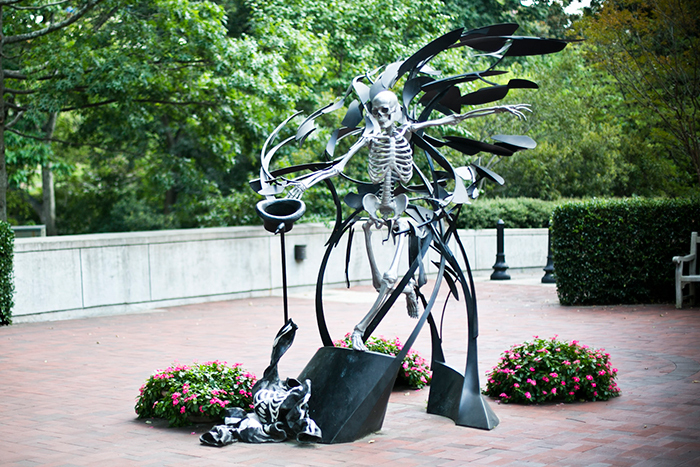 Artist Matthew Palmer created Emory's ephemeral mascot in stainless steel and cast and fabricated bronze. The 2008 piece was commissioned as part of a student initiative to commemorate the University's "Lord of Misrule." 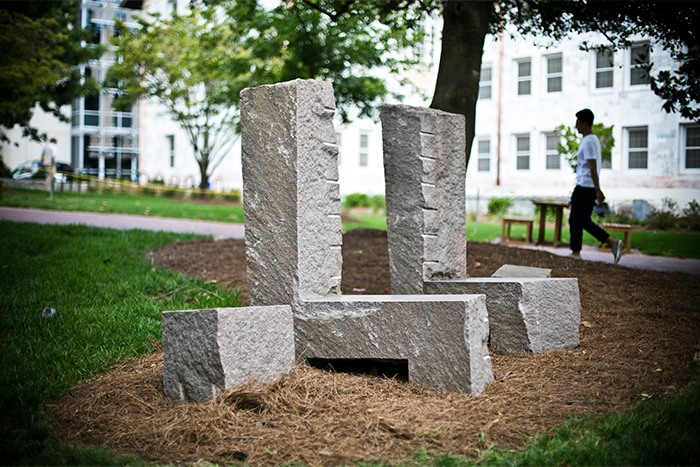 "Stone Grove" resides in the green area between Cox Hall and Dobbs University Center. Environmental sculptor Richard Nonas trained as an anthropologist and takes a minimalist philosophy in producing his works. "Stone Grove" is an illustration of Nonas' theory of space and material and is meant to mark the space on the hill between the Dobbs University Center and Cox Hall as a public meeting place around campus. "An American Dream" is on the east side of the Woodruff Physical Education Center. 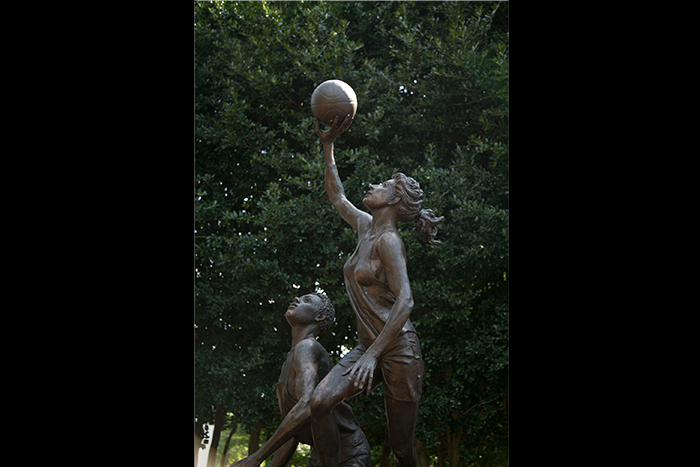 The 9-foot-tall sculpture by Wayne Southwick is of a young woman and young man playing basketball; the woman is scoring. The "dream" is about the hope for equality for women in sports as well as the realization of men's activities and ambitions. Southwick was former chief of orthopaedic surgery at the Yale University School of Medicine. 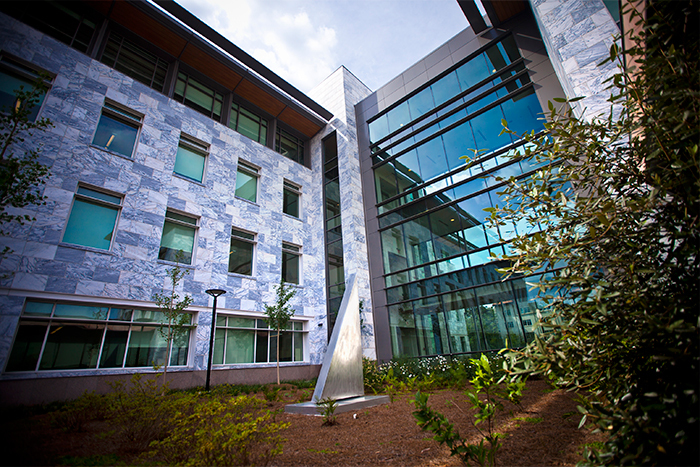 "Untitled" is now in place at the courtyard of the new Health Sciences Research Building on Haygood Drive. The triangular-shaped work is located between the wet and dry lab wings of the building. The sculpture was created by Illinois native Dorothy Berge, considered a talented welder in sculpting her three-dimensional works. This piece stood in the second-floor lobby of Cannon Chapel for a number of years prior to its new location.